Kidapawan Massacre: A sequel to Yolanda? MANILA, Philippines - A multi-sectoral coalition denounced President Aquino and heads of concerned cabinet departments and agencies not only their failure to address the issues raised by peasants and Lumads but also for the violent dispersal in Kidapawan City last Thursday. The result of violent dispersal vs. law enforcement in Kidapawan. 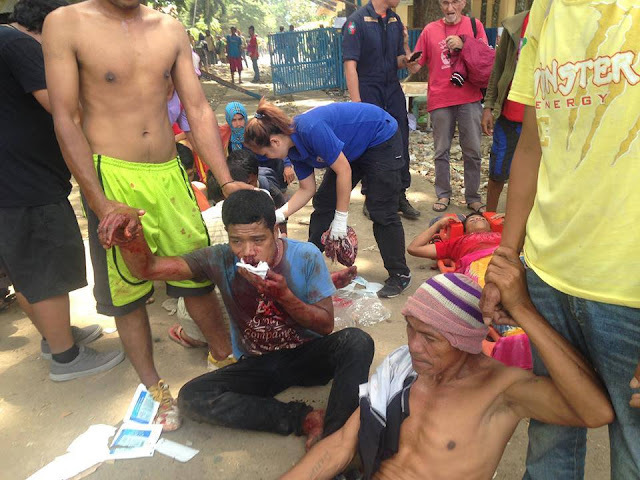 The police dispersal claimed three lives so far from the ranks of the farmers and dozens more injured and unaccounted for by their families after protesting the lack of government support in face of the impacts of the El Nino phenomenon. Sanlakas said in an e-mailed statement that the much-delayed statements of condemnation from Malacanang spokespersons and it Liberal Party bets and pledges of sanctions for those accountable on the ground is “rubbing salt into the wounds inflicted on the hapless bodies of the starving farmers”. “The President and national government officials are washing their hands and pinning the blame on the local government. It is the responsibility of government at all levels – but the national government especially - to address the impacts of El Nino and the state of climate-induced calamity. ” said Lidy Nacpil, Sanlakas chairperson. The group deplored the inadequate preparations made by the government despite the fact that the Philippine Atmospheric, Geophysical and Astronomical Services Administration (PAGASA) had foreseen its impacts as early as March 2015. “The incompetence, insensitivity and gross neglect of responsibility on the part of the Aquino administration is condemnable,” Nacpil said. Meanwhile Roldan Gonzales, chair of Sanlakas Mindanao called on the government to declare all 68 provinces affected by El Nino in a “state of calamity” to avert any more violence that may ensue between starving farmers and security forces. He asserted that the government should not wait for the El Nino impacts to be fully felt before declaring a ‘state of calamity.’ “The government has to cushion impacts by ordering a price freeze on basic commodities, expedite the release of financial aid, provide immediate employment, and ensure proper management of water resources among others”. “The protests in Kidapawan will soon spread to other places in Mindanao. Our members in Mindanao are talking about hunger and worsening water crisis in Bukidnon, the Lanao and Davao provinces,” he warned. Roldan, who also is an active leader in the campaign for climate justice and in the struggles of Mindanao communities against the impacts of mining, says that the water crisis is the combined impacts of El Nino as well as massive mining activities in Mindanao. He also cautioned against the use of social services by state relief agencies to promote administration candidates. “The farmers maybe hungry and desperate but they are wise enough to distinguish public service from political patronage, the Ozamis City native said.